Today, this audience is being held in two places: as there was the danger of rain, the sick are in Paul VI Hall and connected with us with a giant screen – two places but only one Audience. We greet the sick who are in Paul VI Hall. Today, we wish to reflect on the parable of the merciful Father. It speaks of a Father and his two sons, and it makes us know the infinite mercy of God. We begin from the end, that is, from the joy of the Father’s heart, who says: ‘Take the fattened calf and slaughter it. Then let us celebrate with a feast, because this son of mine was dead, and has come to life again; he was lost, and has been found” (Luke 15: vv. 23-24). With these words the Father interrupted his younger son at the moment he was confessing his fault: “I no longer deserve to be called your son …” (v. 19). However, this expression is unbearable for the heart of the Father, who instead hastens to restore to his son the signs of his dignity: the best robe, the ring and the shoes. Jesus does not describe a Father who is offended and resentful, a Father that, for instance, says to his son: “you’ll pay for this.” No, the Father embraces him, awaits him with love. On the contrary, the only thing that the Father has at heart is that this son is before him safe and sound, and this makes him happy and he celebrates. The welcome of the son that returns is described in a moving way. “While he was still a long way off, his father caught sight of him, and was filled with compassion. He ran to his son, embraced him and kissed him.” (v. 20). How much tenderness; he saw him from afar: what does this mean? That the Father went out continually on the terrace to look at the road and see if his son was returning; that son who had done just about everything, but the Father awaited him. How beautiful is the Father’s tenderness! The Father’s mercy is overflowing, unconditional, and it is manifested before the son speaks. The son certainly knows he has erred and he acknowledges it: “I have sinned … treat me as one of your hired servants”(v. 19). But these words dissolve in face of the Father’s forgiveness. His Father’s embrace and kiss make him understand that he was always considered son, despite everything. This teaching of Jesus is important: our condition of children of God is fruit of the love of the Father’s heart; it does not depend on our merits or our actions and, therefore, no one can take it away, not even the devil! No one can take away this dignity. This word of Jesus encourages us never to despair. I think of mothers and fathers in apprehension when they see their children distancing themselves, entering dangerous ways. I think of parish priests and catechists who sometimes wonder if their work was in vain. But I also think of those who are in prison, and who think that their life has ended; of all those who have made mistaken choices and are unable to look at the future; of all those who hunger for mercy and forgiveness and believe that they do not merit it … In whatever situation of life, I must not forget that I will never cease to be a child of God, of a Father who loves me and awaits my return. Even in the most awful situation of life, God awaits me, God wants to embrace me, God awaits me. There is another son in the parable, the elder; he is also in need of discovering the Father’s mercy. He has always remained at home, but he is so different from the Father! His words lack tenderness: ‘Look, All These Years I served you and not once did I disobey your orders … But When Your son returns … ‘ (vv. 29-30). We see the contempt: he never says: “Father,” he never says “brother,” he only thinks of himself; he boasts of having remained always beside the Father and of having served him; yet he never lived this closeness with joy. And now he accuses the Father of never having given him a kid to make merry. Poor Father! One son went away, and the other was never truly close to him! The Father’s suffering is like the suffering of god, the suffering of Jesus when we distance ourselves, or because we go far away or because we are close without being close. The elder son is also in need of mercy. The just, those who believe themselves just, are also in need of mercy. This son represents us when we wonder if it is worthwhile to toil so much if then we receive nothing in return. Jesus reminds us that one does not remain in the Father’s house to have a compensation, but because one has the dignity of co-responsible children. It is not about “bartering” with God, but about following Jesus who gave Himself on the cross without measure. “My son, you are here with me always; everything I have is yours. But now we must celebrate and rejoice” (v. 31). So says the Father to the elder son. His is the logic of mercy! The younger son thought he merited a punishment because of his sins; the elder son expected a recompense for his services. The two brothers do not speak to one another; they live different stories, but both reason according to a logic that is foreign to Jesus: if you do good you receive a prize, if you do evil you get punished. And this is not Jesus’ logic, it isn’t! This logic is subverted by the Father’s words: “It was fitting to make merry and be glad, for this your brother was dead, and is alive; he was lost, and is found” (v. 31). The Father recovered his lost son, and now he can also restore him to his brother! Without the younger, the elder son ceases to be a “brother.” The Father’s greatest joy is to see that his sons acknowledge each other as brothers. I greet the Italian-speaking pilgrims, addressing a particular welcome to the faithful of the diocese of Oppido Mamertina-Palmi, accompanied by the Bishop, Monsignor Francesco Milito and those of the Basilica of Saint Sossio in Frattamaggiore, with the Bishop of Aversa, Monsignor Angelo Spinillo. It is my heartfelt hope that your Jubilee pilgrimage will strengthen you in your adherence to Christ and in your generous resolutions of Christian witness. I greet the Asian and African priests of the Saint Paul Apostle Pontifical Missionary College; the Antoniano Institute and the Saint Gotthard Foundation, which observes the 20 years of its foundation. I exhort you to live the Extraordinary Jubilee in such a way as to discover the exigency of the corporal and spiritual works of mercy as nourishment of our faith. A particular thought goes to young people, the sick and newlyweds. Next Sunday, we will celebrate Pentecost. Dear young people, I hope that each of you will be able to recognize, among the many voices of the world, that of the Holy Spirit, who continues to speak to the heart of one who is able to listen. Dear sick, especially you guests of the Cottolengo of Trentola Ducenta, entrust yourselves to the Spirit who will not let you lack the consoling light of His presence. 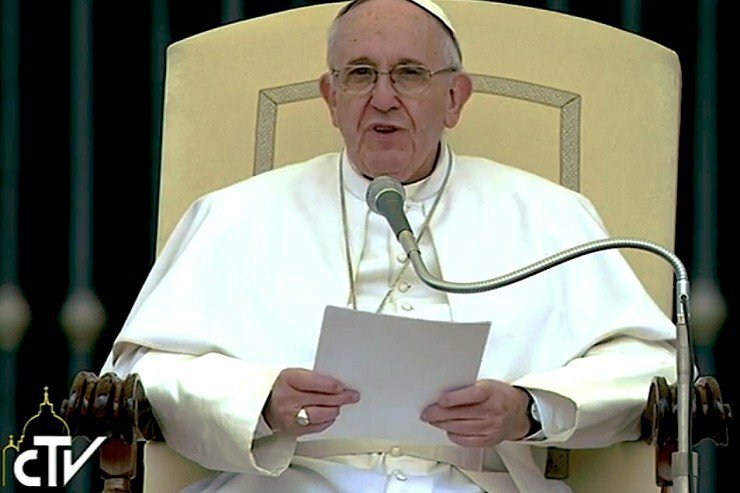 And you, dear newlyweds, particularly the couples of the Focolare Movement, I hope that you will be, in the world, mirror of God’s love with the fidelity of your love and the union of your faith.